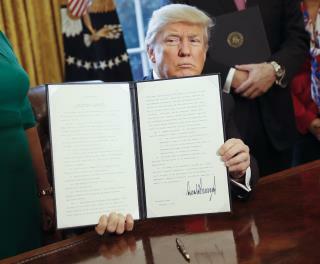 (Newser) – President Trump launched his long-promised attack on banking rules that were rushed into law after the nation's economic crisis, signing new orders Friday, the AP reports. Wall Street cheered him on, but Trump risks disillusioning his working-class voters. Trump directed his Treasury secretary to review the 2010 Dodd-Frank financial oversight law, which was signed by President Obama to overhaul regulations after the financial and housing crisis of the past decade. It aimed to restrain banks from misdeeds that many blamed for the crisis. Trump also signed a memorandum instructing the Labor Department to delay an Obama-era rule that requires financial professionals who charge commissions to put their clients' best interests first when giving advice on retirement investments. But he told me he loved me? So Trump supporters thought they were voting for someone who would look out for the working stiff huh? What a freaking mess you've all made you dummies.